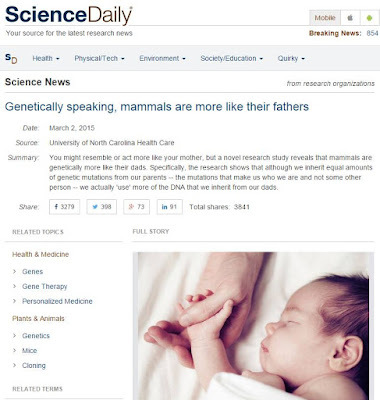 The Chronicle of Cultural Misandry: New Study Suggest Fathers' DNA Responsible for Uniqueness in Children. New Study Suggest Fathers' DNA Responsible for Uniqueness in Children. "You might resemble or act more like your mother, but a novel research study reveals that mammals are genetically more like their dads. Specifically, the research shows that although we inherit equal amounts of genetic mutations from our parents -- the mutations that make us who we are and not some other person -- we actually 'use' more of the DNA that we inherit from our dads." 'For the Nature Genetics study, Pardo-Manuel de Villena's team, including first author James Crowley, PhD, assistant professor of genetics, selected three genetically diverse inbred strains of mice that were descended from a subspecies that evolved on different continents. These mice were bred to create nine different types of hybrid offspring in which each strain was used as both father and mother. When the mice reached adulthood, the researchers measured gene expression in four different kinds of tissue, including RNA sequencing in the brain. They then quantified how much gene expression was derived from the mother and the father for every single gene in the genome. "We found that the vast majority of genes -- about 80 percent -- possessed variants that altered gene expression," Crowley said. "And this was when we discovered a new, genome-wide expression imbalance in favor of the dad in several hundred genes. This imbalance resulted in offspring whose brain gene expression was significantly more like their father's." Source: "Analyses of allele-specific gene expression in highly divergent mouse crosses identifies pervasive allelic imbalance"
When children need health care and practitioners not finding out the link nor causation due to the frequent demonization of fathers' involvement in their children's lives because of the feminist movement, we can definitely accuse them for causing a lot of deaths and lack of knowledge for the treatment of diseases. How long are we gonna tolerate this movement that is destroying and betraying humanity?